Walks and Walking Snowdon in Wales along the Llanberis Path. 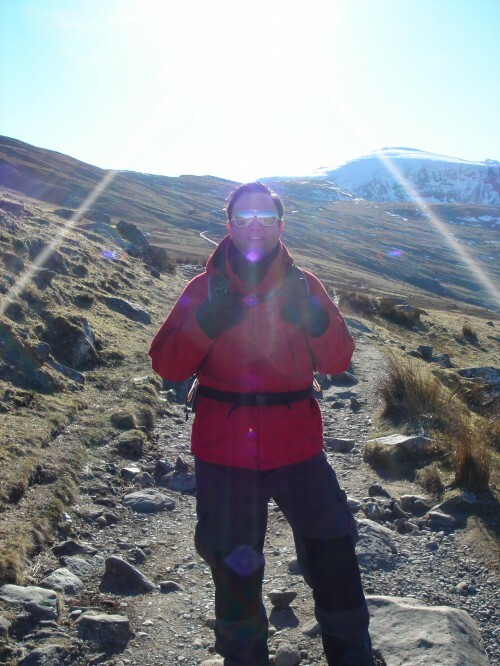 I completed this Wales walk last March 2010 when there had been quite a bit of snow, although the day we walked The Llanberis Path the weather was absolutely fantastic; crystal clear blue skies and wonderful fresh air. I highly recommend you ensure you have the correct equipment for this walk at this time of year; sensible layers, a windproof jacket, gloves, woolly hat, sturdy walking boots with a vibram sole, walking poles and ice axes just in case. For this walk I decided to wear my bright red Bear Grylls jacket and walking trousers from the Bear Grylls Survival Clothing range. The Llanberis Path is the longest and most popular pathway up to Snowdon, is roughly 5 miles from the railway station to the summit and is very easy to follow. From LLanberis we had a quick look around before finding the main car park for the station. Passing the car park we turned right to a small road and a small square where we found a gate at the far end. This is the start of the walk as it makes it’s way up a roughish by-road and the railway now on our right. The walk basically follows a parallel path to the railway line and there is a left hand turn that steadily rises until we head under the railway line up to Halfway House. Now the harder part of the walk commences but the beautiful sight of a frozen lake, Llyn Du’r Arddu, still manages to put big smiles on our faces as we look down at Cwm Brwynog. As we circle around the cwm we walk underneath the railway line at Clogwyn Station and this is wear the walk started to get very exciting with most people stopping to put their crampons on and swapping walking poles for ice axes. We decided to stop here for lunch and admired the most stunning of views looking back at Llanberis Pass. Moving on the pathway swings round to the south under the dome of Crib y Ddysgl and finishes close by the railway and the terminus is then reached. We then walked back the way we came!